Steven MacLean, who missed the decisive penalty, believes the players will bounce back from defeat. 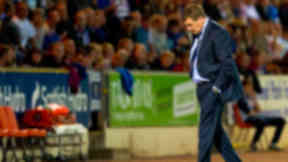 Steven MacLean admitted that St Johnstone’s players were devastated by their Europa League exit to FC Minsk but insisted they will bounce back. Saints failed to protect a 1-0 lead from the first leg of their qualifying tie as a Milos Rnic volley forced extra time and penalties. Dave Mackay and Patrick Cregg had penalties saved but goalkeeper Alan Mannus kept them in the tie with two stops before MacLean saw his powerful penalty blocked by Vladzimir Bushma. "We're all gutted in there," MacLean said. "They were a stuffy team to play against. “They just sat with everybody behind the ball. They didn't show any ambition. "To be fair they got their goal but I think it was their only shot on goal. The striker said that recovering from the defeat would be a test of character but that he was sure the squad was resilient and would respond in the right way. "I tried to go for power [with my penalty] but the keeper has guessed right,” he said. "It's easy when everything is going well. But this is what it's all about now. “When things go wrong, it's the real players who come out fighting. We've got guys in there who will come out fighting and I'm sure we will." St Johnstone boss Tommy Wright had been unhappy with Minsk’s physical approach to the game and MacLean echoed his manager’s feelings. "They kept fouling us just as we were going through and it was one of those nights,” he said. “I think they should have had a man sent off. "Early on the boy fouled me when I was clean through. The referee tried to say there was four defenders. But I don't know where he got that from. We've been unfortunate, to be honest. "I don't know what happened with the one at the end but the boys have said it was a stone-waller. The referee didn't give us much."